may cause uncontrollable need to sew. alright! ready to make a shirt?! honestly, it’s not that hard. you can do it! rah rah! or snaps first you’ll make your pattern. 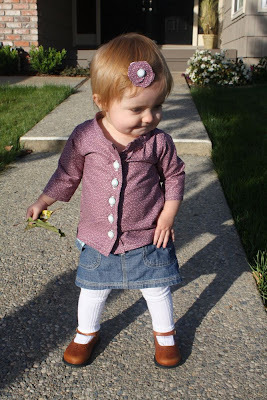 find a shirt that fits your child well, and trace around the bodice and sleeves, as shown. 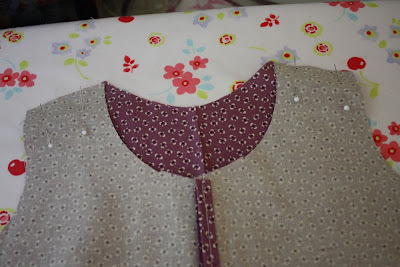 also, on the pattern, mark where the shirt scoops in the front. i like using bits of wrapping paper for patterns! it’s great for using up those random pieces you get stuck with after wrapping a gift. plus, it’s cute! 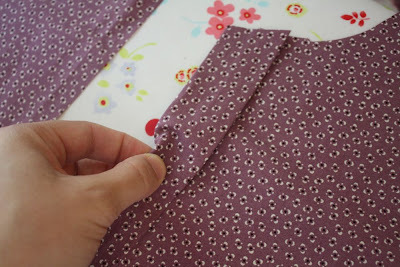 next….well…..ok, you don’t have to do it this way, you could always hem at the end, but i kind of liked doing it this way. 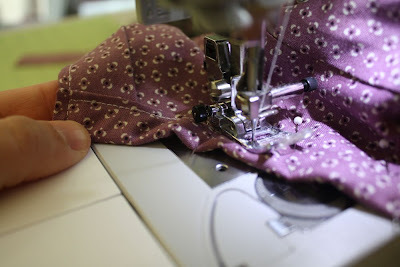 it makes hemming a lot easier, in my mind. 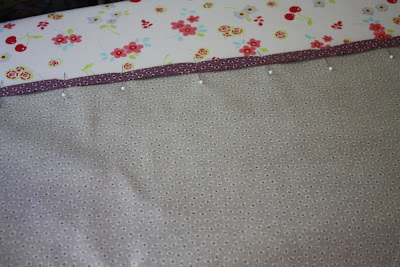 so what you’ll do is at the longest side of your fabric, iron the edge over about 1/2 inch, and then again 1/2 inch, pin, and sew along the edge of the folded fabric. this will be the hemmed part of the shirt and sleeves. 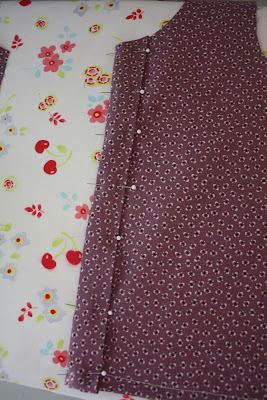 BTW, 1/4 seams for most of the rest of the project. 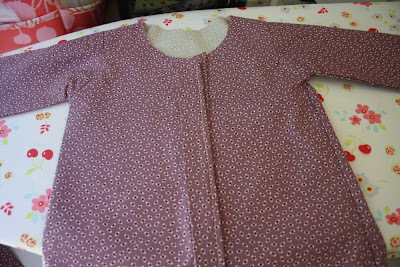 next, cut out two pieces of each pattern on the fold of the fabric (with an extra 1/4 inch for seam allowance), making sure the bottom of the bodice and edge of sleeves are the “hemmed” part. 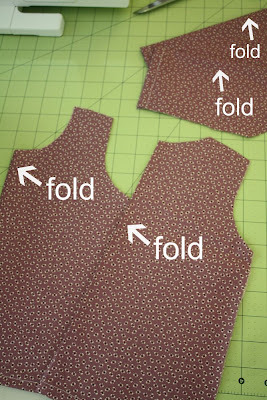 on the front piece, fold in half, and cut down the middle. 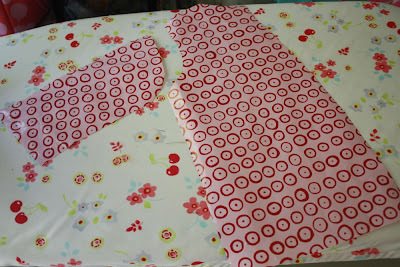 next, cut as long a strip as you can from your fabric, 3.5 inches wide. 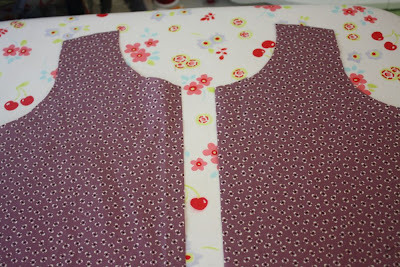 then sew long ways, right sides together, turn right side out, and press with the seam in the middle. you should have something like this. 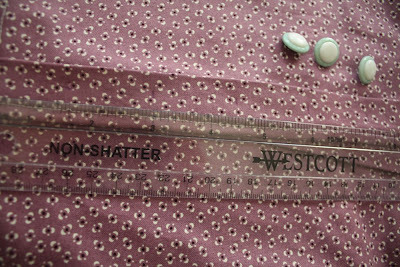 now cut a piece for either side of your bodice front, curve the top piece to fit, and leave an extra 3/4 inch on the bottom to wrap around. then, you’ll wrap the “tube” (so to speak) around about 1/4 inch to cover the raw edge. does this picture help? pinning will help also. what the back will look like after this step. zig zig or serge that bottom raw edge first, don’t be like me and forget! then sew it down like so. 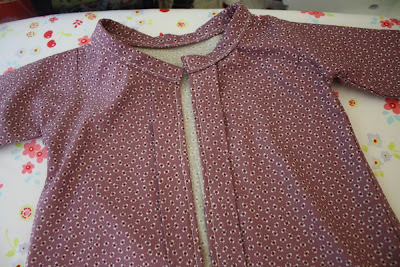 next, right sides together, sew shoulder seams together. zig zag or serge seams. press with iron, if you like! i generally like to press as i go along…unless i get lazy. 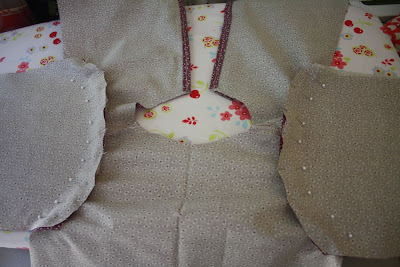 next, grab your shoulder pieces and pin them into their “slots”. 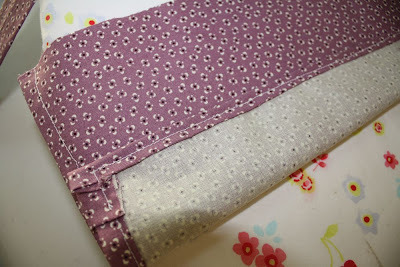 sew and zig zag edges. 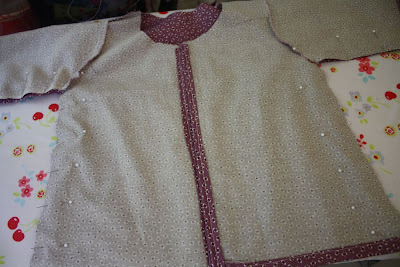 now pin right sides together along underside of sleeve and the side of the shirt. 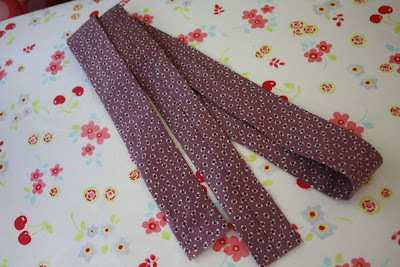 now would be the time to sew in some ribbon for a sash, if you like. 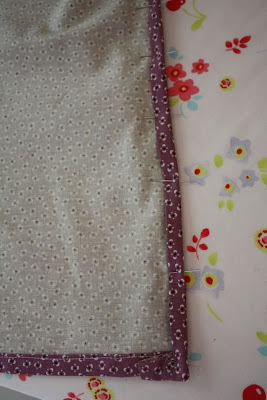 sew along the edge, zig zag or serge seams. carefully clip a few times under the armpit seam. now it’s time for the collar! it seems like the trickiest part, but it’s actually the fastest. take the rest of your tube, and turn in the end about 1/2 inch to enclose raw edges. 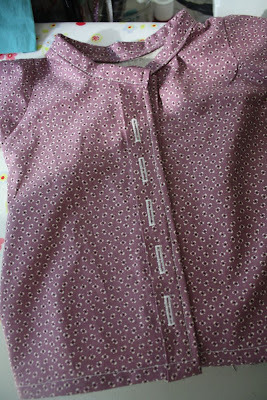 (hopefully you have enough from your long strip, if not, make another long enough) then, simple fold over the collar raw edge and pin down. 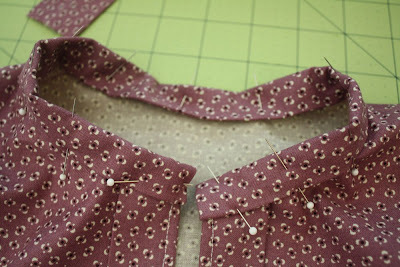 when you get to the other end, cut it off an inch past the end and turn in the edge as well, making sure it lines up with your shirt. sew around like so. 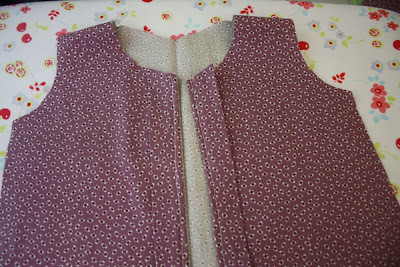 (heh heh) drop down from the top, back stitch, and then continue around the collar. now figure out how many buttons you want, and where they will go. i spaced mine about 1.5 apart. i marked them here with my disappearing ink pen, but alas! the ink is purple. hehe. 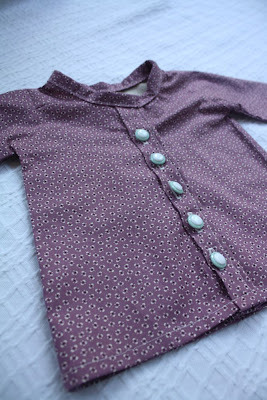 use your button maker to make button holes…just use your sewing machine’s manual and practice practice practice! 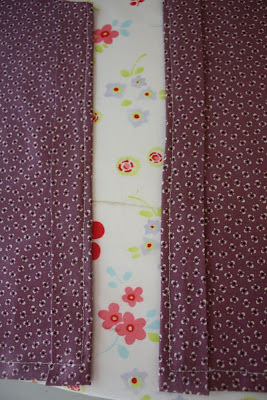 i made about 5 or 6 button holes before i got this stitch working well. 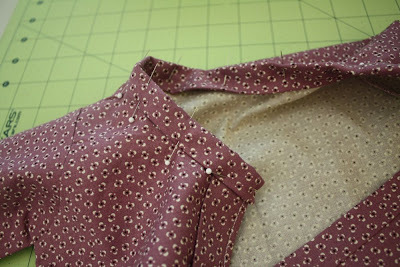 i picked out two full button holes. (which ARE NOT easy to unpick.) or you could use snaps. 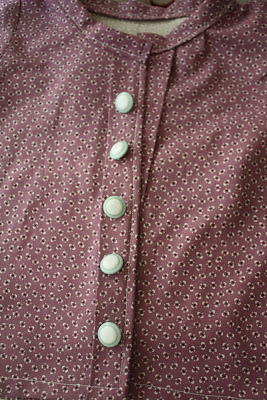 i almost did, but i wanted to use these cute turquoise buttons. REALLY bad. 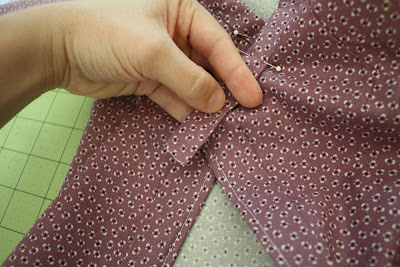 then, make the same spaced marks on the other shirt flap, making sure they line up visually too, and sew on your buttons! then admire your shirt you made. from scratch. with barely a pattern. love it! i’ll definitely have to try this! thanks!